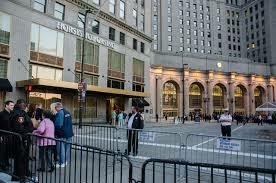 Most casinos court prospective gamblers with fancy exteriors. Bright lights, music, water displays, unique architecture – anything that creates a ‘love at first sight’ feeling. Not so at Cleveland’s Horseshoe Casino. Approaching the building in our Uber ride, we weren’t sure if the building before us was an old office building, department store or multi-use downtown structure. Located downtown in the historic Higbee Building, the exterior still looks like the historic Higbee Building. Arriving before dark, the unlit signage wasn’t obvious, and the place looked pretty dull. Horseshoe Cleveland Casino entrance and adjacent hotel at dusk. Through the brass and glass doors, we entered onto the first floor — a ‘great hall’ of slots and table games — basically, a beautiful long and narrow high-rise lobby turned casino. Still not particularly exciting, but the gaming floor was comfortable and lively with slot players and table gamers. 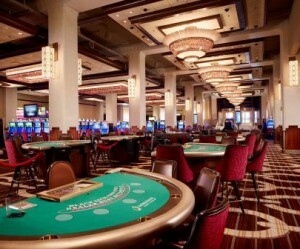 What distinguishes this casino, however, is its four floors – each with unique features and a different feel on each level. One flight up, the gaming floor is shared with a casual food court area and formal, elegant bar. Similar slots are clustered in various areas, and the result is an interesting mix that nearly feels like a series of different rooms. Two escalator banks ferry gamers between the first and second floors. In addition, the downstairs buffet and the third-floor World Series of Poker Room and Diamond Lounge can be accessed from the main group of escalators. I like the four-floor layout and love Horseshoe’s no-smoking environment. As far as the slot play on the casino’s more than 1,600 games (including 200 video poker), I was disappointed in the dominance of penny slots with 30-, 40-, 50- and even 100 minimum bets. Thankfully, the second floor has more quarter and 50-cent slots and I found ta five-cent slot area on the first floor as well. The usual back-and-forth play of slots yielded a stream of steady losses until I eventually won back $47 on a 30-cent Glitz machine, which softened the evening’s negative numbers. 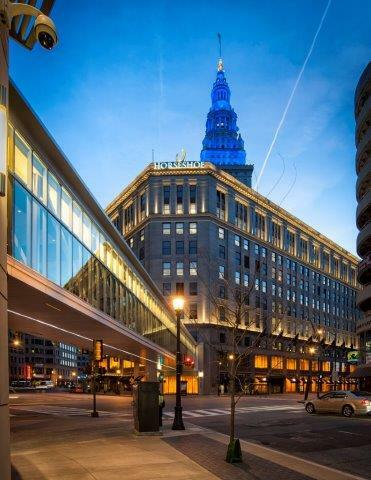 Although the Horseshoe does not have its own hotel, it partners with and is connected (through Tower City Center) to the Ritz-Carlton and Renaissance Cleveland. A nearby Westin also is listed on its website. Restaurants include The Spread Buffet, B Spot, Corky & Lenny’s deli, and Rosie and Rocco’s pizza. Tag Bar and Lounge also is off the skywalk, along with two other lounges amid the gaming floors. Because of its location, parking is not free until after 6 on ‘non-event’ nights, although I did see a kiosk that boasted a ‘play 30 minutes, park free’ swipe. Horseshoe Casino also is part of Caesars Entertainment Total Rewards program, and in addition to its partner hotels and own restaurants, has worked with other downtown establishments that participate in its Total Rewards program. In addition, the casino has some fun promotions including, ‘Luck Be a Lady’ Thursdays which enters women in special drawings in the early evening and Super Senior Wednesdays for gamblers 55 and up. Horseshoe Casino is ‘the only game in town’ and is doing a nice job in Cleveland’s lively downtown environment, but one can only think, if a second casino ever opened in the area, the Horseshoe would have to up its game to court its clientele and create a bit more excitement to attract and retain visitors. Smoke Ventilation A+ smoke free!